This is the photo I was working from yesterday. It's the February challenge for the wet canvas watercolor group and is taken in Kettlewell in the UK. The plan is to do a deep dive into what happened yesterday and how I can fix it. Let's start with what went right and what went wrong and work towards producing something more satisfying. Some things worked out. The drawing is not too bad and certainly not the main thing letting the painting down. The white van and the tree behind it work well as does the foreground shadow (the shape could be a little better). The shop window definitely looks like a shop window and there's enough (but not too much) detail to make it read well. However, there's a fair amount of bad too. The bad points mainly boil down to wrong values (mostly too light) and color (not enough of it). There's also a little sloppiness in some of the brushwork but to me that is of secondary importance. One other thing that is also worrying me is the overall color scheme and its lack of unity. Right now let's concentrate on getting the values right and see what that gives us. So let's get down to work. First a value sketch in 3 values. This is done at half size (8x10) with Payne's grey. I tried to keep to 3 values - darkest darks, mid tones and lights. Actually 4 values if we're counting the white paper. Even with this quick sketch things are looking better. The smaller size has helped me place the building on the page better and also not fuss with any detail. The walls of the house have been darkened down to mid tones. Making them darker than roof better reflects how the light is hitting the building. 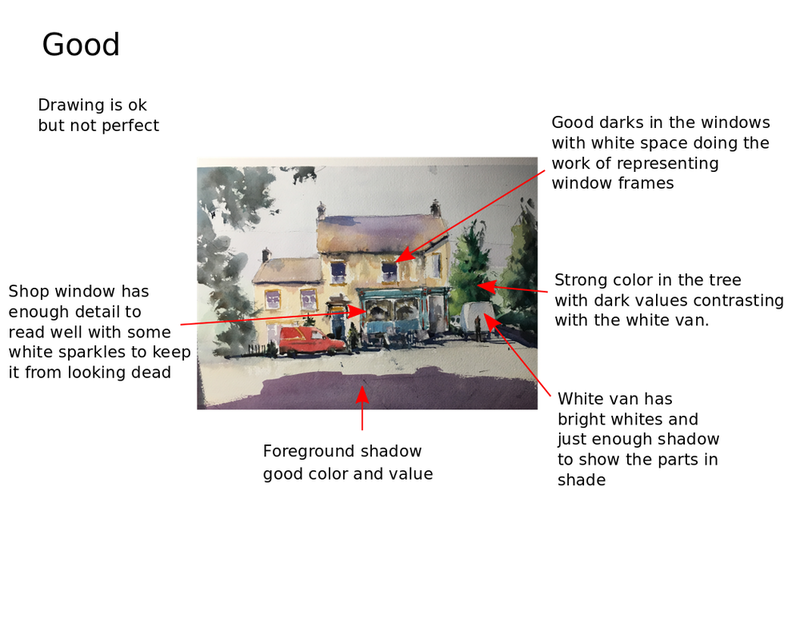 The van has been taken down from a mid value to a dark value which ties all the darks across the mid section together. This feels a lot better. I'm still a bit unsure about the roof values. The chimney shadows are attempting to define the boundary between the roof and the sky but not succeeding very well. My thoughts are to bring in some texture to separate those rather than value. Next - let's play with some color. So the walls need to be darker than before but not dead. I'm planning to warm them up somewhat (quin gold, burnt sienna, touch of ultramarine) to give some strength and value. Similarly with the van. I don't want to lose the strength of the local color so will darken with burnt sienna and a touch of ultramarine. For greys I'm going to move to my favorite combination of cerulean blue and cadmium orange. This produces a delicate grey that can be warmed up or cooled down depending on the proportions of blue or orange. Will any of this help? Who knows.